The Spencer Academies Trust has congratulated A level students on a record-setting year for results across the group. All trust sixth forms recorded an improvement in average A level point scores and A*- B passes, with results across the group up by a median of just under half a grade per entry – an overall performance that will make a real difference to the life opportunities accessible to individual students. 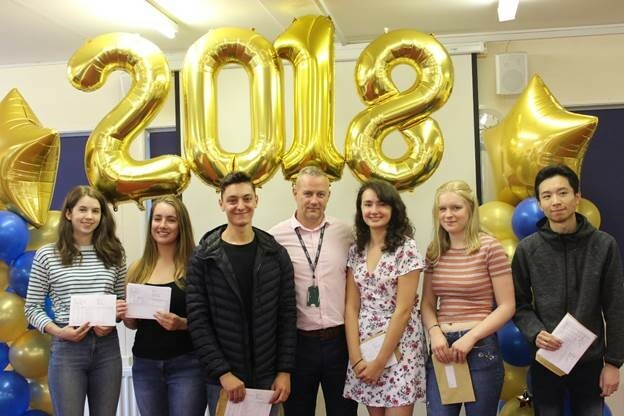 Just over a quarter of A level entries across the trust were at the highest grades of A* and A, and half of all results at B and above; constituting close to a 5% improvement across Trust sixth forms for grades B and above year on year. At George Spencer, which was the highest attaining sixth form in Nottingham last year at A level, further improvement was recorded in the average grade per entry; with almost a third of A level entries graded at A*- A. At 32% of the total, results at George Spencer outstripped the national average for the proportion of A* – A results by a remarkable 7%. Stand out students included Charlie Griffin with three A* grades and now headed to Cambridge; and Joshua Langfield and Archie Watson, with four and three A* grades respectively. Other trust schools celebrating today include John Port Spencer Academy, one of the largest secondary schools in the UK and which became part of the Spencer Academies Trust in 2017-18 academic year. The sixth form at John Port registered a 6% increase in grades A*-B year on year, with A*- B grades constituting an impressive 54% of the total. An increase of just under 5% was registered in results at grades A*- A, constituting 27% of the total, and well above the national average for the highest grades. Nine students received the highest grades across the board, including Niamh Garrett and Lucy Stokes, who have both secured places to study medicine. At Derby Moor, which has been part of The Spencer Academies Trust since January 2018, a 12% increase was recorded in grades of B and above; with an average A level point score increase at almost one grade per entry. Stand out students included Sophie Sidhu, who received three A levels at A* and now plans to study costume with textiles at Huddersfield and Faisal Mansoor, who achieved three distinctions in business and IT and now plans to take business and economics at De Montfort in Leicester. At Spencer’s Heanor Gate Academy, staff were delighted with an improvement of 9% at grade A* – B, and total gains of around a half a grade per A level entry. Six students at Heanor Gate recorded the highest scores across the board, setting a new school record. Principal Steve Huntington congratulated the students with stand-out individual performances, and said results were a testament to hard work of students and staff. The new record follows judgement of the Heanor Gate sixth form as ‘good’ in a 2017 Ofsted inspection. Over the next academic year, total A level entries from Spencer schools will double, as the trust completes a ground-breaking partnership with the Trent Academies Group. Group results should be further strengthened by the addition of the high performing sixth forms at Rushcliffe and Arnold Hill. Students who haven’t yet accepted their A level places in a Spencer or Trent Academies Group sixth form are encouraged to contact schools directly, and to confirm their intention to accept conditional offers. Picture: Heanor Gate Principal Steve Huntington celebrates with record-setting A level students Kay Hallam, Imogen Dunn, Sam Jones, Francesca Downs, Natasha Martin and Anthony Chung.